I failed in my quest today - my quest to find a pair of yellow shoes. But if I learned anything from Don Quixote, it's that it doesn't matter if you fail in your quest, it only matters that you have a quest and continue to strive for it no matter what obstacles you encounter. There's nobility and grace in that. So even though I may never find the perfect pair of yellow pumps, I'll continue to search for them. That's kind of a silly analogy, but Ten Thousand Things' Man of La Mancha is kind of silly. And I mean that as the highest compliment. It's playful and profound at the same time. The play-within-a-play set in a prison seems like a perfect choice for Ten Thousand Things, considering a large part of their work is performing in prisons. I imagine it has a different sort of poignancy in those locations than it did in the spacious room at the Minnesota Opera Center where I saw it. 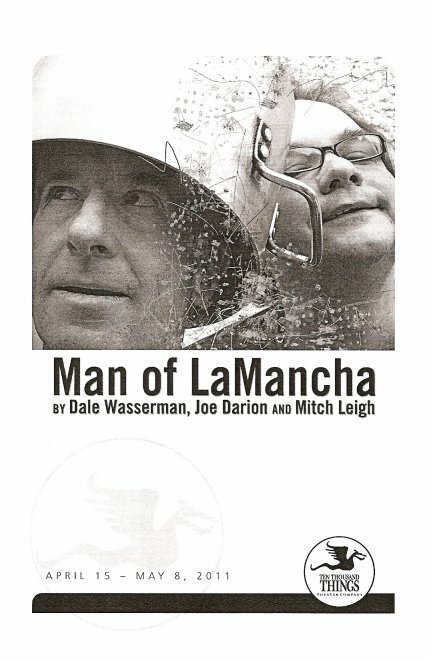 Man of La Mancha is a musical based on Spanish author Miguel de Cervantes's seventeenth century novel Don Quixote. Cervantes is the main character in the piece, a poet who, after being thrown in prison, pleads his case to the other prisoners by telling the story of a crazy old man who thinks he's a knight named Don Quixote. Cervantes and his servant act out the story, and the other prisoners also play roles, at first reluctantly, and then enthusiastically. Steven Epp (whom I last saw in The Homecoming in Baltimore) is crazy brilliant as the mild-mannered poet who transforms into the charmingly insane knight. His version of the signature song, "To Dream the Impossible Dream," is different than you've ever heard it. It starts off as a vulnerable, unsure, almost whispered idea of a dream, and grows into the strong confident voice of a man fighting against all odds. It brought tears to my eyes. Cervantes' servant and Quixote's squire Sancho Panza (whom Quixote calls Tonto, Santa, and various other names in a running gag throughout the show) is played by Luverne Siefert. I've seen Luverne in a few different productions over the last year, and I've come to believe he's a true clown, in the best sense of the word. He can take a simple throwaway line and turn it into the funniest joke, just through his line delivery or the expression on his face or way he moves across the stage (or in this case, floor). He's truly a delight to watch. Regina Marie Williams (who was also in TTT's recent production of Doubt) plays the prostitute Aldonza whom Don Quixote sees as the beautiful lady Dulcinea. This is a woman who lives a hard life with no beauty in it, and because of the way this man speaks to her and treats her, she begins to believe in herself and the world again. Rounding out the cast and playing multiple roles are Tracey Maloney, Matt Guidry, and T. Mychael Rambo (who lets his amazing voice ring out a few times during the show). It's so much fun to watch this cast work together and with the audience. Since the show is performed in the same style as it is on location, the lights are up, so the actors frequently look at the audience and make side comments. At one point Quixote grabbed someone's program to make a dagger to fight with, and Steven handed part of it back saying, "my bio's in there." I was sitting in the front row very close to the action; I was afraid someone was going to end up in my lap! One of the beautiful things about watching a Ten Thousand Things production is that it's so intimate and immediate, you really feel like a part of the show. It's almost like watching the neighborhood kids put on a show in the basement, if only your neighborhood were populated with the most talented actors, directors, and musicians in the Twin Cities. In typical Ten Thousand Things style, the music is less of a focus than in the typical production of a musical, focusing instead on the story, in which conversations morph into songs and back into speaking. That's not to say that the music and sounds (by Music Director Peter Vitale and Michael Pearce Donley) are not lovely, but it's not the lush musical sound you might expect from a musical. The props all come out of Cervantes' box and include a muffin tin for armor, brooms for horses and/or lances, and a metal bowl as a helmet. It's sort of a double suspension of disbelief, as the prisoners make do with what they have to tell the story, and we as an audience go right there with them. It's a truly magical transformation. Don Quixote is only defeated when forced to look into a mirror and face reality. All of his noble dreams fall away and he's just a simple, sick, old man again. But that spark is still in there, as at the end of his life he remembers. Don Quixote sees life as it could be, not as it is. Because sometimes "too much sanity is madness," which I think was never more true than it is today. I rarely watch the news because it's overwhelming and depressing to focus on all that is wrong with the world. The world of Don Quixote is a much nicer place to be, at least for 90 minutes on a Sunday afternoon. The show is playing for two more weekends, check it out if you want to escape from reality for a little while and be taken on a wonderful journey.